This painting is modeled from a 1945 snapshot of Crew 24 taken with their B-24 "Liberator." The original snapshot was taken with Pete LaLena's (Crew 24 waist gunner) camera in March 1945 at the Charleston, SC, Army Air Force Base. The artist is the son of Crew 24 navigator, Nathan Nemirow (DOD 1999). The poem below, "Crew 24 Meets Again in Sarasota," was written by Steve Nemirow. 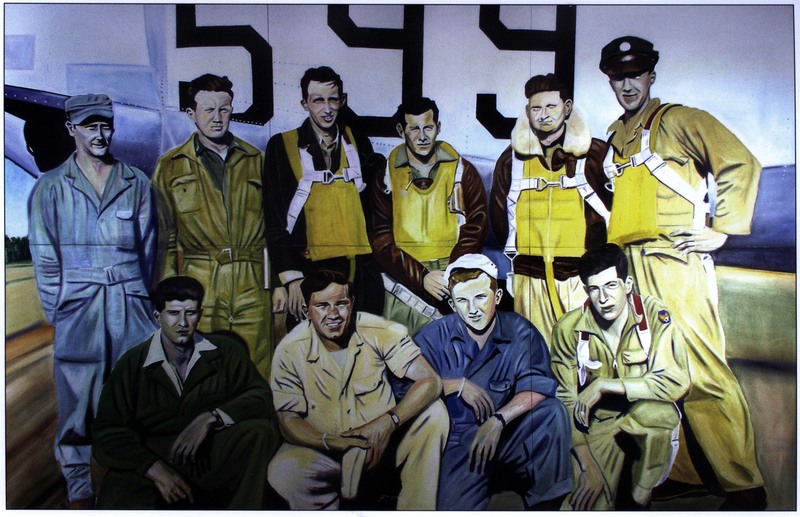 This painting was unveiled at a ceremony at the Evergreen Aviation Museum in McMinnville, Oregon, on May 18, 2002. This information was provided to the 380th Bomb Group Association by Pete LaLena (Sound Beach, NY). Front Row, l to r: Phil Rindone, Flight Engineer; Lauren Smith, Ball Turret Gunner; George Previs, Armorer; Howard Robbins, Radioman. Back row, l to r: Everett Philbrook, Tail Gunner; Nate Nemirow, Navigator; Charles Swanson, Pilot; John Pelligrini, Co-Pilot; Raymond Hopkins, Bombardier; Pete La Lena, Waist Gunner. Slung from the wings of a shining B-24. gracefully, like dancers with long practice. the white sun on the white sand Florida beach. neckties snugged, each insignia in its place. jammed in a crevice in the back of the plane). 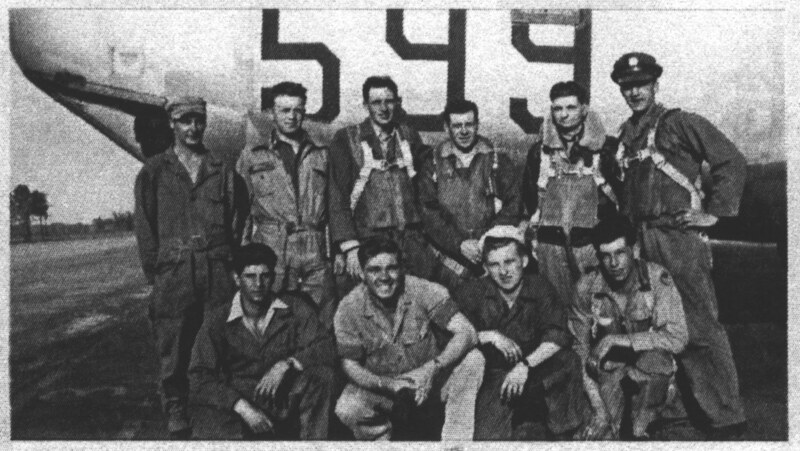 beside their bulky boxcar of a bomber. The pilot confident, with hawk-hooded eyes, his tousled hair. The impatient copilot, a youngster looking for a good time. The navigator, the pilot's pal, who he thought should've been a rabbi, but for the war. waist gunner in his crash cap. Radio operator, glance askew all these years. Each man emphatically alive, young, in the sun. then nine, as time wound its moving camera. Then eight. Fifty years later they gather here. the earned loyalty to their pilot, to the bright constellation of the crew itself. save for the missing faces, hands, laughter. this smile in a photograph from long ago.